WavePad is an audio editing tool for novice, enthusiasts, and also professional music editors. Compatible with both Mac and Windows, the software lets you seamlessly edit and record voice, music, and other types of audio recordings. The editing suite comprises basic to advanced functionalities such as cut, copy, delete, paste, silence, insert, compression, and pitch shifting. The audio effects include normalize, amplify, envelope, equalizer, echo, reverb, and reverse. Also, WavePad supports pretty much all kinds of music and audio file formats, including mp3, vox, wav, wma, gsm, aif, real audio, and aac. Batch processing permits applying effects and/or transforming several thousand files as one function. Also, you may create regions and bookmarks to easily locate, assemble and recall segments of lengthy audio files. WavePad’s user interface is simple and straightforward, which even an amateur would feel comfortable using. The simplicity, however, doesn’t mean compromises on the feature-set front. The software comprises a large tool-set that helps accomplish a wide range of audio editing tasks. The layout is clean and inviting, and the easy-to-navigate toolbar can be found atop the audio editor. The toolbar tools get altered as you click different ribbon tabs. Needless to say, it is quite handy from an organizational perspective. If required, you may even customize the toolbar so that accessing any tool you wish becomes easier. 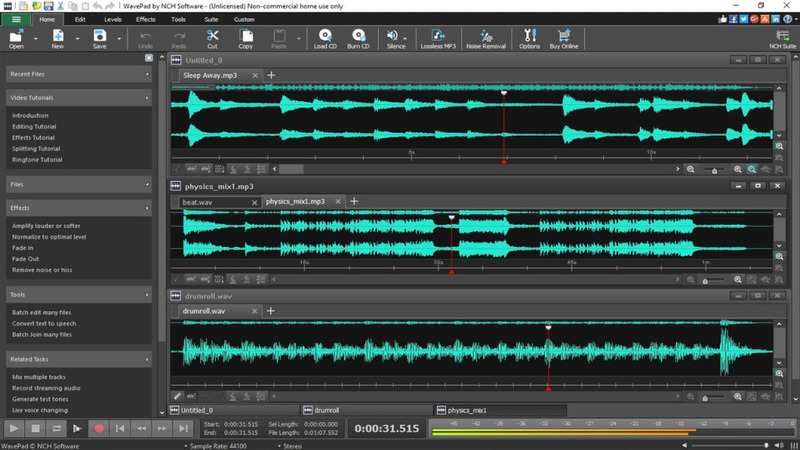 WavePad Audio Editing Software is a full-featured professional audio and music editor. You can record and edit music, voice, and other audio recordings. WavePad is perfect for professional audio editors or just for anyone who wants to edit their own personal audio files. This free sound editor includes many audio editing effects such as amplify, normalize, equalizer, envelope, reverb, and more. Easily edit audio files with cut, copy, paste, delete, insert and several others. Audio restoration features includes noise reduction and click pop removal. just as all i want for my work..thanks for this application. Very nice audio editing software. I can easily edit musics, it's user friendly. very easy and good features ever. its also good for background voice editing. This software is very good for editing youtube files. Disability matters: NCH offers the most user-friendly interface I have ever. Disability matters: NCH offers the most user-friendly interface I have ever encountered! It’s hard to know if the companies original approach was to develop the ideal package for those of us with SLD/dyslexia (and its associated problems) – or whether it was merely a freak of software evolution, but they have certainly hit the nail on the head. NCH offers the most user-friendly interface I have ever encountered! The success of Mix Pad and its integrated companion Wave Pad lie in its visual simplicity, overall logical layout and menus that are easily understood. If you are not an accomplished producer: FX’s, add-ons and a host of presets are set to meet an immediate need. Very rarely have I found the desire to wander from what I find to be perfection. Import, cut, paste and drag, with the simplicity of fade points is another major success of these products: long gone is the clumsy cumbersome fiddling needed of other rivals. The power and ease of the mouse across the interface could not have been made easier for me. I almost feel as if the company designed these products specifically with me and my difficulties in mind. If granny’s dementia could be cured by a simple note: don’t forget to turn off the cooker – then the world would be a better place. Dyslexia is brain damage, it cannot be cured, and my poor short-term-memory holds the biggest obstacle to software usage. NCH has made huge strides in offering the perfect user-friendly product that stands out as the market leader in SLD provision. I would never switch to a different brand: quite simply put - NCH packages are so easy to use! So: it’s hard to imagine how the product/s could be improved. I would have but one recommendation for the team at NCH. The latest version of Mix Pad has adopted a darker colour scheme – and in this latest version, I find it very hard to distinguish, when for example; the track solo button is depressed or not. A user option to return to the ‘Classic’ colour scheme or alternate schemes of choice (suitable for the blind and/or partially sighted) would make this product/s - unbeatable! Congratulations to you all at NCH – keep up the good work!